Don’t be deterred by the weather! 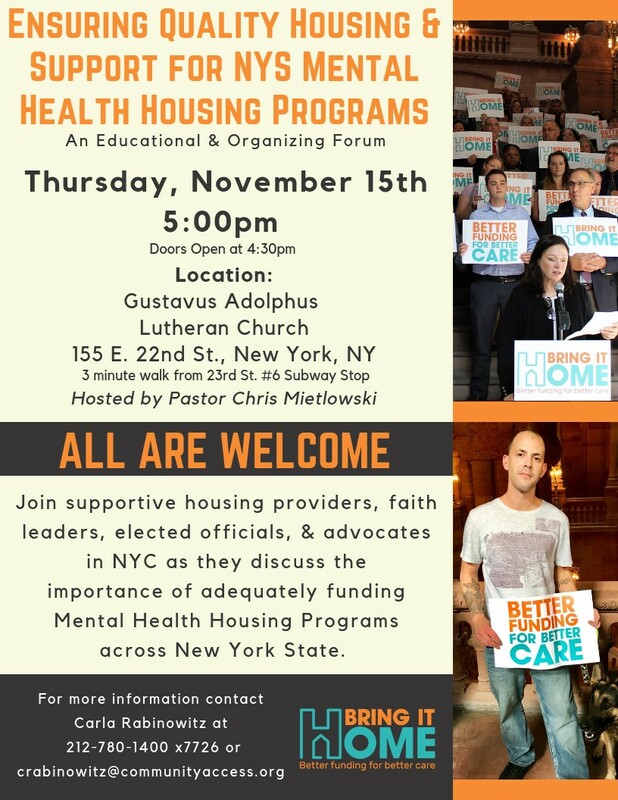 Join us TODAY, Thursday at a pivotal housing forum at 5:00 pm at Gustavos Lutheran Church, 155 East 22nd street, between Lexington and third avenues in Manhattan. Still seats open if you have not already registered. Leaders of the Bring It Home Campaign will talk about what they are doing to ensure quality supportive housing in NYS. Supportive housing providers, residents, Faith leaders and elected officials will speak. If you can not attend, Feel free to forward the event info to anyone. Hope to see you this Thursday the 15th at 5:00 pm at Gustavos Church, 155 East 22nd Street in Manhattan . Doors now open at 4:00 pm. We are working to get hot beverages. Food served. Everyone welcome, staff, tenants, those interested in mental health, friends.